Reading David DuChemin’s excellent – and free – ebook, “Ten: Ten Ways To Improve Your Craft Without Buying Gear”, Tip No. 1 struck a chord with me, based on my own recent experience. It’s something I’ve been trying to do with my own photography for a while now: not just get the “walk-up” shot – the one that everyone gets just by “walking up” and planting their tripod feet in the most obvious spot – but really working a scene from different angles until I find the very best composition it has to offer – what professional photographers call “the money shot”. Driving through the Palouse with friends this past June, we were touring the back roads looking for old barns and abandoned cabins, when we came upon this log cabin up on the side of a hill (see second image). We stopped our SUVs on the side of the road, maybe a quarter of a mile below the cabin, which seemed to be as close as we could get, put on our longest lenses and everybody got the walk-up shot. 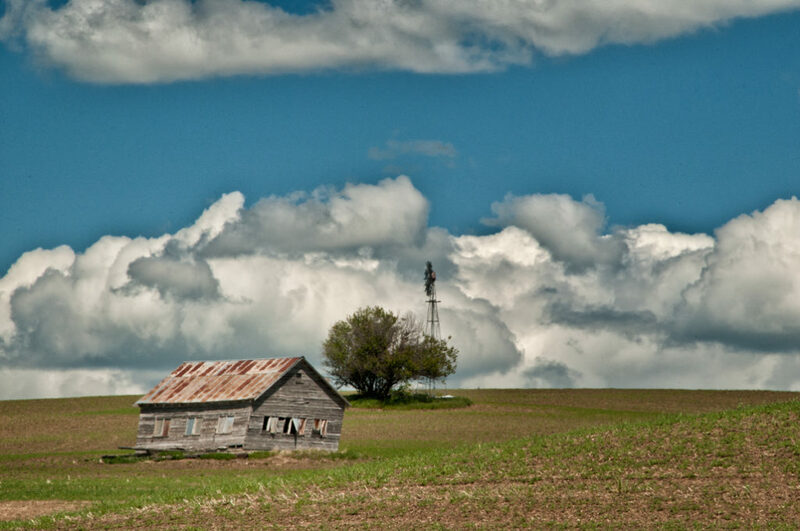 It’s a nice enough image but nothing special: there are dozens of shots like this to be had all over the Palouse. 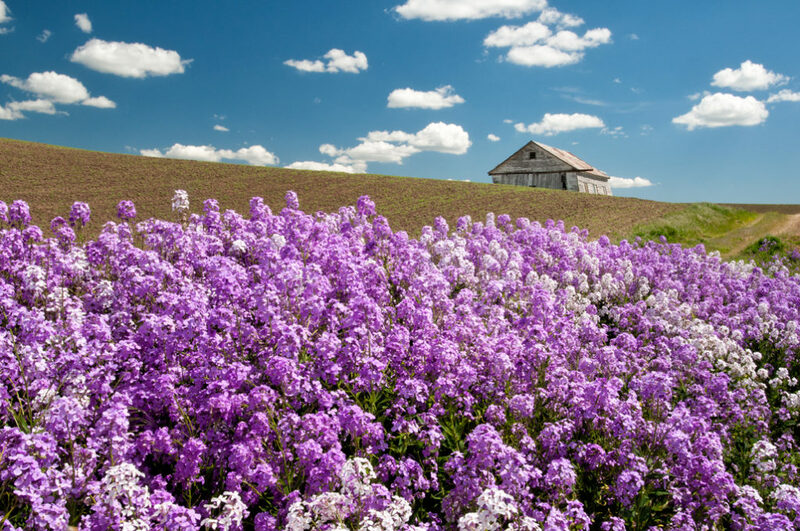 We all piled back into our vehicles and drove on down the road, when one of my colleagues said, “Look at those flowers”, pointing to a big clump of purple wildflowers growing on the side of the hill, a few hundred feet below the cabin. That was it! I knew immediately that that was the best shot this scene had to offer: the cabin framed by that big clump of wildflowers. But I knew I would have to get pickier to capture it. I asked my friend to stop the car. He refused, as we had already lost sight of the lead vehicle and anyway, he insisted, there was no way to get into the right position for the composition I had in mind. I hesitated a moment, not wanting to seem unreasonable or to inconvenience my friends. Then, I dug my heels in. “Stop the car!” I shouted. He eventually pulled up and, at my insistence, reversed up the road to a spot where I thought I could just make out an unused dirt track, leading up to the cabin. 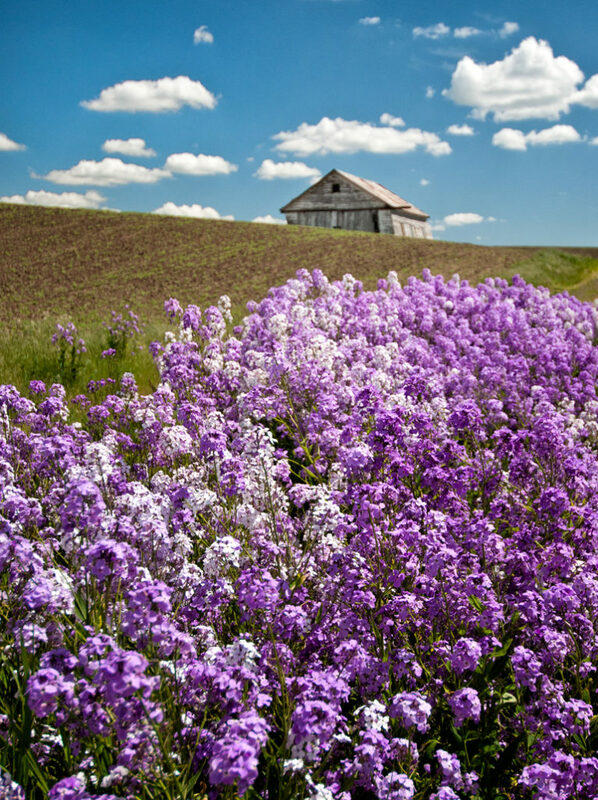 We turned off the road, on to the dirt track, climbed the hill and, there, just as we crested the hill, was the shot I had pre-visualized: the clump of purple wildflowers perfectly lined up in front of the abandoned log cabin – the money shot! We radioed to the lead vehicle to turn around and come back. Reluctantly, they did. But, as soon as they saw what we had found, their reluctance evaporated. Everybody got the walk-up shot and the money shot – because I got pickier, acted unreasonably and insisted on getting the best possible shot. Several of my colleagues even thanked me for insisting that we stop. Compositionally, I placed the cabin in the top-right third of the frame, waited for the clouds to move, so that they weren’t merging with the cabin roof, and focused on the foreground, leaving the cabin in soft-ish focus, giving it a dreamy, faraway look to emphasize the fact that it was abandoned. And I shot the scene in both vertical and horizontal formats – which is always a wise thing to do. So, get pickier – and get the money shot. I was sufficiently inspired by Mike Moats’ recent blog demonstrating a technique of shooting flowers through glass that has been treated with RainX, a liquid which makes water bead, that I had a go at this technique today. Here are the results of my first experiment. What I learned is that this technique can produce beautiful, intriguing images but it is a lot trickier than it looks. From my brief experience with it, I am sharing the keys ingredients for success in this blog post. Dry the RainX on the glass, using a cloth, before applying the water. And experiment with spraying the water at different nozzle settings, to produce larger or smaller, fewer or more bubbles. 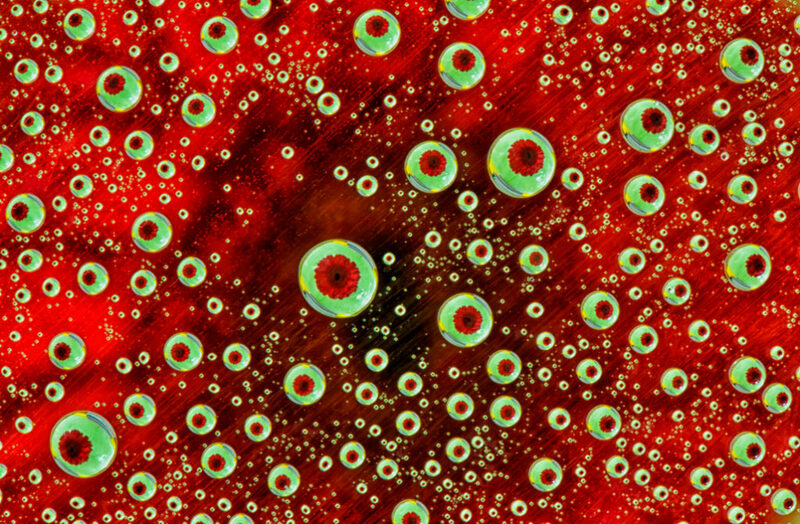 Fewer, larger bubbles seem to produce a stronger image. Choose different color combinations of flower and background paper. I used red, yellow and purple Gerbera daises in different combinations with yellow, green, lilac and red backgrounds and found that a yellow flower with lilac paper produced the most pleasing result. The normal considerations of color theory help in choosing the best combination of flower and paper. It’s essential to use a flower which has all its petals. Any missing petals will show up as gaps in the background of the image. The glass and the front of the lens have to be parallel to each other, otherwise ugly reflections strike the surface of the glass and spoil the look of the flower in the image. I used a spirit level on both the glass and the lens to get them parallel. While I started shooting near a large window, I found that the bubbles picked up the window light as bright highlights in each bubble (see final image, below). I ended up shooting in a dark hallway, simply to avoid getting glare on the glass. As a result, most of my exposures were long: 90 seconds. 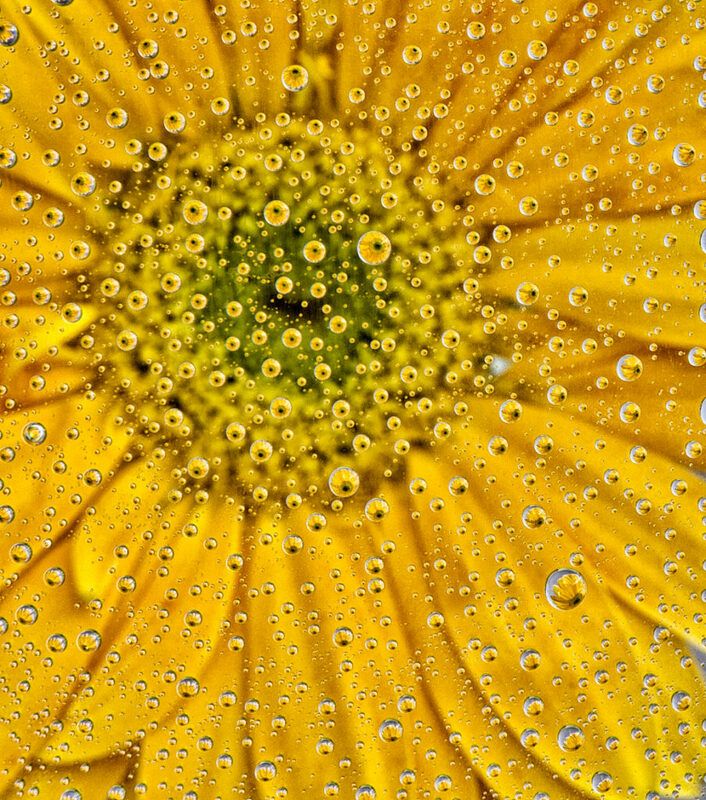 Vary the distance between the flower and the glass and between the glass and the lens. 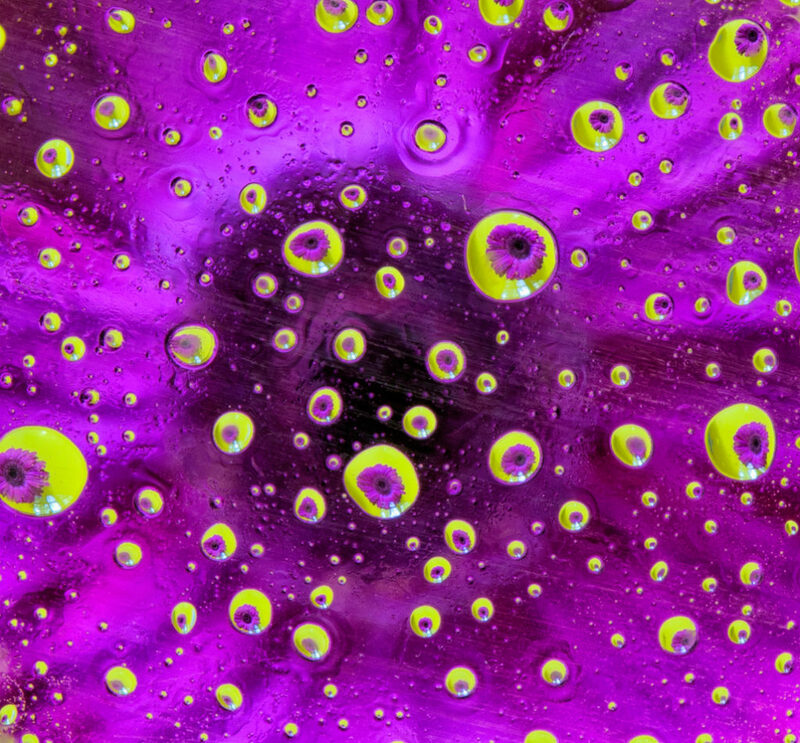 The further below the glass the flower is, the more the bubbles pick up the color of the paper, which gives the most pleasing look to the resulting image. Experiment with different lenses and focal lengths, as each lens will allow you to get more or less of the flower in focus. 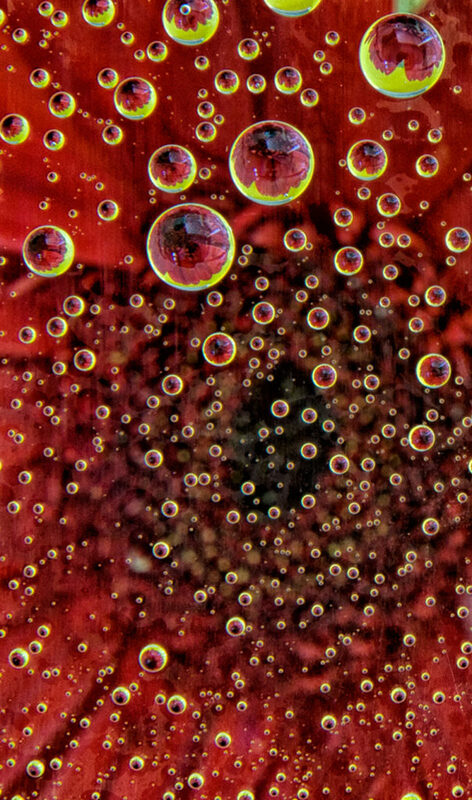 While it is important to focus on the tiny flowers reflected in the bubbles, it is also desirable to have the flower itself in sufficient focus to be able to discern its shape. I started off using a 105mm macro lens and ended up shooting with a 24-70mm mid zoom. The minimum focusing distance of the lens limits how close the lens can be placed to the glass. The final image is one where I messed up, in that the RainX and the water ran together, producing smearing on the glass. I found the result not entirely displeasing. This is a technique that can produce interesting flower images which are outside range of normal flower photos. I expect I’ll be exploring it further in the future. Photographer Jay Maisel said that all photography comes down to “light, color and gesture” – gesture being the act of representing motion. Gesture conveys emotion and, by doing so, it tells the human story of a photograph. The best photographs connect with us on an emotional level. Gesture also allows the viewer to feel a little of what the subject was feeling at the moment the photographer tripped the camera’s shutter. Continuing the theme of last week’s blog, about blurring action to express emotion, this week’s blog features photographs which use panning to freeze the subjects’ faces, while blurring the remainder of the image. The selective sharpness accentuates the emotions showing in the riders’ faces. 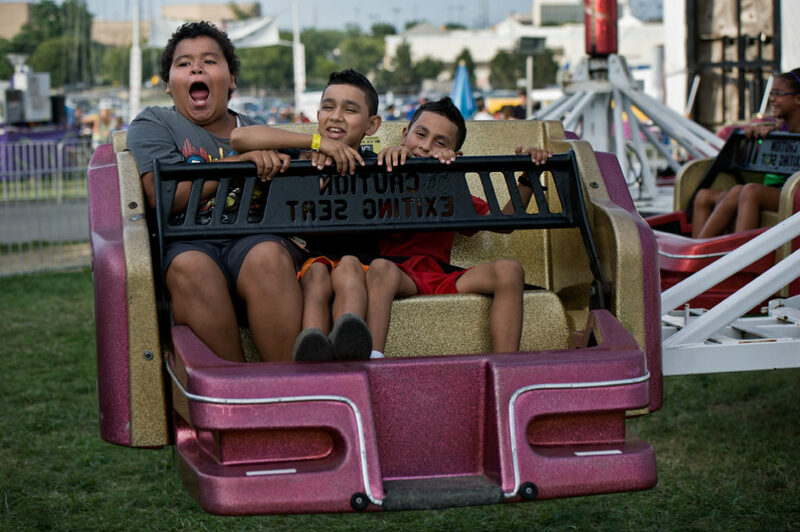 All the images were taken on the same ride at the Montgomery County Fair, at the point where the riders are hurled in one direction, then suddenly dragged sharply back in the opposite direction. It’s the point where the riders’ bodies are subjected to the maximum g-force, where their facial expressions best show the thrill of the ride. 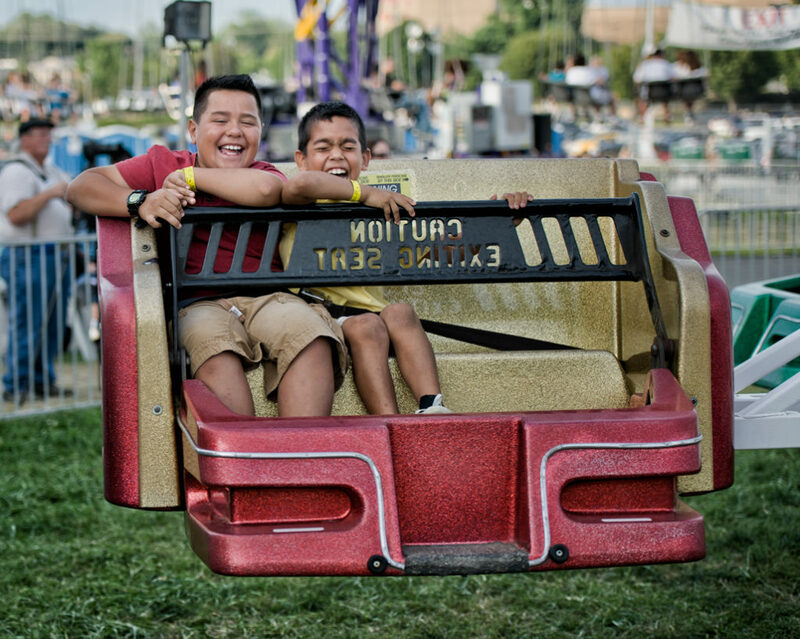 Last weekend, I went with friends to the Montgomery County Fair. 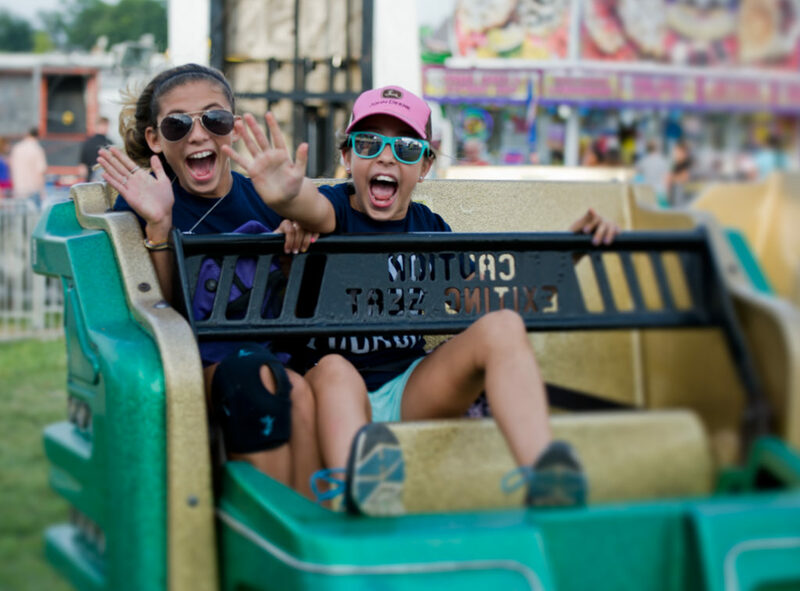 It was a quintessentially American summertime experience: a hot sunny day, huge crowds, blaring pop music, noisy fairground machines, kids eating candy floss and outrageously unhealthy food, including deep-fried Oreos! 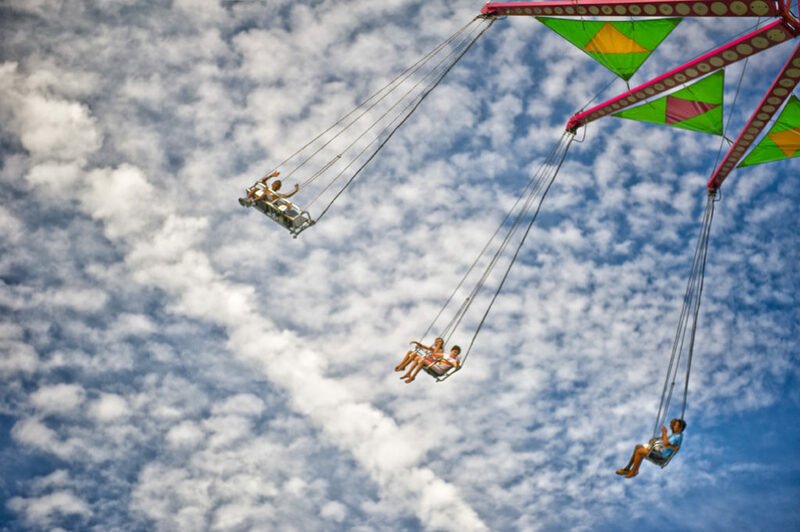 I used the various fairground rides to experiment with both blurring and freezing motion, exploring which would best convey the emotion and excitement of the fair. The lead image was shot standing directly beneath the carousel, using a 16-35mm wide angle lens. I set my camera on Continuous High mode, at which it shoots five frames per second, and selected Shutter Priority with a shutter speed of 1/40th of a second, expecting that the slow shutter speed would blur the riders as they flew by overhead. This produced an aperture of f4. Although all photographs are static, the blurring of the riders in this image tells the viewer that they are moving fast. The diagonal composition of this image, with the tower emanating from the bottom-right corner of the frame, also gives a sense of energy to the picture. The second image was shot on a 24-70mm lens wide open at f2.8 and a shutter speed of 1/1250th of a second. The fast shutter speed froze the fast-moving carousel and the riders. 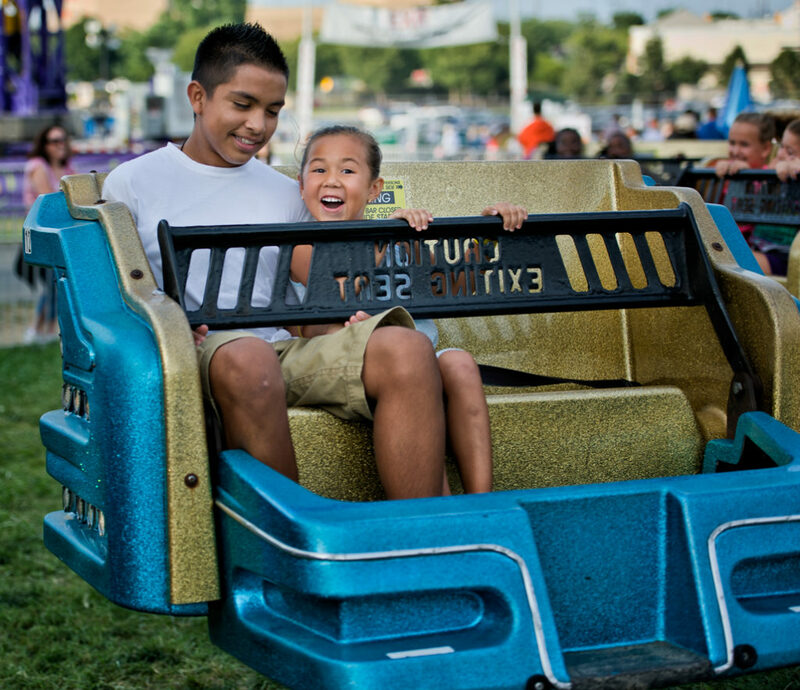 The elements of the image which impart a sense of motion are the angle of the riders to the carousel’s arms and the raised-arm gesture of the boy in the lead seat. Gesture is itself an act representing motion. 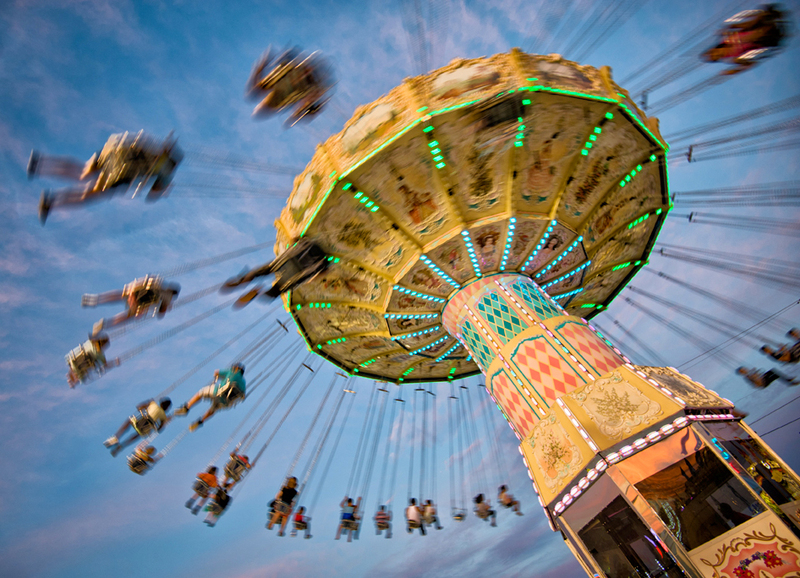 Comparing the two images, it is clear that the lead image, in which the slow shutter speed has blurred the riders, conveys a much stronger sense of motion and more successfully expresses the emotion and thrill of the carousel ride. Why Remove the Color from a Flower? Blind people often hear better than sighted people. It seems that, when the brain is deprived of one of the senses, it compensates by developing other senses more acutely. This phenomenon is particularly marked in music: blind people hear notes more accurately than those with vision. As a fan of blues music, I have often wondered why so many of the great blues players were blind: Blind Willie McTell, Blind Lemon Jefferson and Blind Boy Fuller. I have also marveled at their seemingly enhanced sense of touch: how can they play guitar so well, when they can’t see the strings or frets? I found myself wondering if the same principle could be applied to our appreciation of photography. If the photographer prevents one of our senses from operating on an image, will our remaining senses perceive it more acutely? What is it that attracts us a flower? Mainly, its color, of course, but also its scent, shape and the texture of its petals and leaves. In a photograph of a flower, the scent is already absent. But what if the color is removed as well? Will we appreciate the shape and texture more? I tried out this theory in the blog image of a lotus. In reality, the lotus petals were vibrant pink in color and its leaves a succulent green. 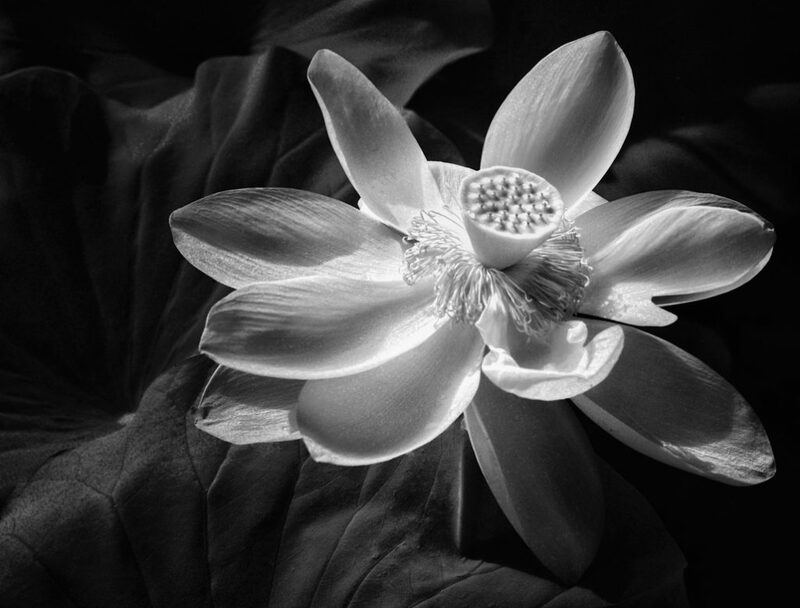 I photographed the lotus in infrared, then converted the image to black and white. It may seem counter-intuitive to remove the color from such a beautiful flower but, somehow, without the colors, I am able to better appreciate its form. And I can almost reach out and touch the texture in its sumptuous leaves. 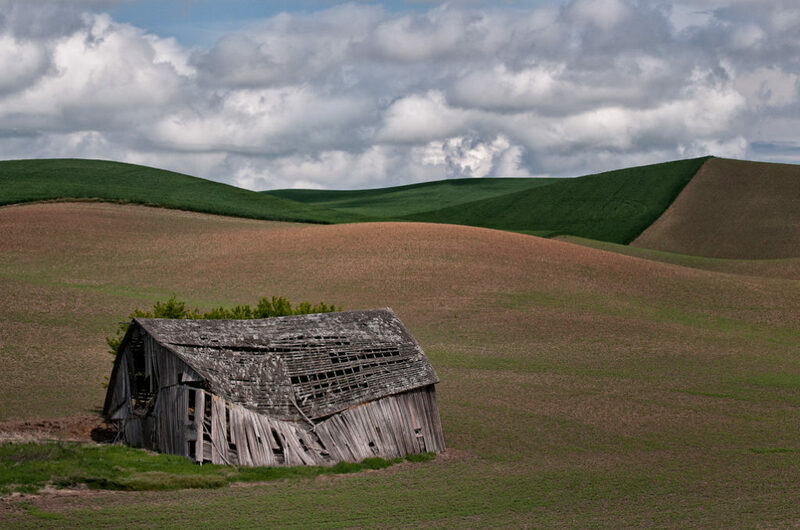 One of the great pleasures of travelling through the countryside of the Palouse agricultural area of Washington State, in the Pacific northwest of the United States, is the number of old wooden barns that dot the landscape. These old barns form an essential part of the history of the region, each one bearing its own story of the family that built it, of all the seasons that have passed since its construction, of the many harvests it has safely sheltered. But, as time takes its inevitable toll on these beautiful old structures, their wooden materials are unable to withstand the constant punishment of wind and weather. Some, like this beauty on the outskirts of the town of Moscow, Idaho, are on the point of succumbing to collapse. New barns rise up to replace the originals. But their more modern, man-made materials – often metal roofs and sidings – are no match for the beauty and character of the original wooden structures. To a photographer’s eye, metal will never hold the same beauty as the tones and textures of weather-beaten wood.